That’s right – the competitions are back baby YEAH! 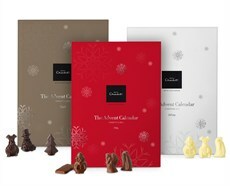 We’ve had THREE great Advent calendars donated by Hotel Chocolat which you can enter to WIN! Don’t want to wait? Do you just want one now? Pop over to their special Advent calendar page HERE and grab yourself one in white, milk or dark chocolate. Perhaps you subscribe to my assertion that Advent calendars are really covering a SINGLE DAY because a day has 24 hours and an advent calendar has 24 chocolates. Coincidence? I think not! I’m giving one away on Facebook, one here and one on Twitter! All you have to do to win on Facebook is to just share the status update here: https://www.facebook.com/MostlyAboutChocolate/posts/1057212574323274 and then update Rafflecoptor so we can collect your email address so if you win I can get a hold of you. All you have to do to win one here is leave a comment of more than 10 words about why you love Advent calendars. For example, I love advent calendars because they not only provide one chocolate a day but if you buy a case, you could have 24 days of 24h of chocolates – one chocolate for each hour and one calendar for each day! And that’s it! I’m using Rafflecoptor so I can collect your email and I will check you did share or tweet or leave the right kind of comment. Of course as with all things, there are rules and I do have to have some as some people have tried to cheat in the past. 6.Your details will be passed on to Hotel Chocolat so that they can send you the Advent calendars. I always get their catalogues so you might after winning too. 9.You must be available to respond to my email by no later than 2pm GMT on Wednesday November 25th so you can get your calendar in time otherwise a new winner will be chosen at that point. 154 Responses to #Winning is THREE Hotel Chocolat Advent Calendars up for Grabs! I love them because you know when it is time to open door 1, Christmas is very close! It is lovely to have a liitle chocolate treat each day too! anticipatory part of Christmas for me, that little bit of chocolate which leads nearer to the loveliness which is the Christmas choc fest! I love advent calendars because I love the daily chocolate treat and the exciting countdown to the Big Day! OMG that is a AWESOME idea! mmm a case of advent calendars, why haven’t I thought of that? I love them because I’m a big kid at heart and it gets me excited in the run up to Christmas. It also helps me remember what date it is, which can be helpful at times! I love Christmas advent calendars because they are a tradition that I have always appreciated and loved taking part in, a chocolate a day to mark the count down to Christmas, what’s not to love…!!! I just hope there is a chocolate for Xmas day too! I love advent calendars because it’s a countdown to Christmas. I love Advent Calendars becomes it’s the sign Christmas is really coming, we guess the shapes behind each door and whoever has the most wins at the end gets a prize. The tricky part of course is trying not eating all the chocolates in one go!! I love advent calendars because they mark the start of the build up to Christmas and my daughter’s birthday. I love the surprise when you open your daily door. I love advent calendars for the same reason I loved them as a child – chocolate for breakfast! I love advent calendars not only because it has a nice treat everyday but its a lovely reminder to celebrate a little everyday. The count down to Christmas always reminds me of when, I was little and getting more and more excited that Christmas was coming and reindeer would be dancing on my roof top. I love advent calendars because they feel Christmassy and I like to intentionally miss a day or two to surprise myself with more than one chocolate! Sometimes I end up with more than I expected! I love advent calendars because it seems to make the Christmas countdown go so much quicker! I love Advent Calendars because not only do I get a chocolate a day – but I can legitimately eat it at 8 o’clock in the morning. I love Advent Calenders because I always forget to open mine for a few days & then can have a feast of chocolate when everybody else has eaten theirs! I love Advent Calendars as I love a little piece of chocolate after my evening meal, and an Advent Calendar means I don’t have to make sure there’s some in the cupboard! I love advent calendars because they help to build the excitement in the lead up to Christmas. I love advent calendars because it gives me a reason not to hit snooze every morning. Chocolate for breakfast. Every day of advent is a winning day. I like them because they are becoming so varied these days- not only can you get chocolate ones but also ones with beauty/skincare/haircare items in them. I Love advent Calenders because it creates such excitement on the lead up to christmas and helps you feel like your getting closer and close to that day! I love advent calenders as it’s so lovely to have a nice treat on the countdown to Christmas day while I’m stressing to make sure I get all done ready for the big day!! I love advent calendars because it reminds me not to panic yet as I open the first day’s chocolate treat, while the ones from 15th onwards help me deal with the stress. I love chocolate advent calendars because if you forget and miss a day you have double the pleasure on the next! I really love advent calender’s, as I think they add to the magic of Christmas, by counting down the days and having a little treat or gift each day. Thanks for the yummy giveaway. I love chocolate advent calendars as they get me in the mood for Christmas and I love having a piece of chocolate a day – even though it’s so naughty! I love advent calendars because you can eat them without feeling guilty and if you want you can share them with the kids…! i love them- because they are Christmasy- and i Love Christmas!! – – They are like- a wee gift, a day- and they can look- really cute- too 🙂 Fun! Dark for me, please – only . . . Happy Holidays! Love to be opening a Chocolate Advent Calendar every day, as a child we never had such things, so opening up a door everyday and receiving a chocolate reward would be so wonderful – to be honest I’ve had a Advent Calendar of my own, only bought them for my child, so its my time to see what i’ve been missing all these years ! I love advent calendars because they help me to get the timescale in perspective. Christmas really does start on 1st December for me – not 1st October as the shops seem to think! I love advent calendars for two reasons. 1) Cos who doesn’t love chocolate in the morning and 2) It’s a countdown to my favourite holiday! I love advent calendars because they make the build up even more exciting towards Christmas, plus i love the excuse of eating chocolate everyday! I love advent calendars because it’s literally a countdown to Christmas! A sweet treat to the big build up of more chocolate! I miss the days where some calendars would give you door number 25 and sometimes even going up to New Year. However, I love the new type of calendars, makeup, lego etc… Loads of variation for everyone now. they`re a traditional part of Xmas with a few surprises thrown in too! I love advent calendars because they seem to help the littlest ones with counting! Must be the in built reward system! They remind me of my childhood – my mother used to get me an Advent calendar every year but they weren’t as good as yours!! Yummy!! I get very excited about Christmas, I usually have an advent calendar and an advent candle which we burn in the evening. I love these traditions as they help build up the excitement to the big day (which means going home to see my family) lots! I love advent calendars as they are a fun way to count down until Christmas! Having a yummy treat everyday makes it so much better too! I love advent calendars because I get to eat chocolate at breakfast time everyday! I love advent calendars as the kids are happy to get up in the mornings! I love Advent Calendars because it’s a socially acceptable way to count down to Christmas with a new treat every day! I love advent calendars because it is great to start ech day in December with a little surprise! A wee buzz in the morning before heading off to work in the dark winter months. I love Advent calendars because it’s the only way to stop me eating all the chocolates in one sitting and to ration them to one per day! I love them because chocolate a day makes me smile! I love advent calendars because it’s something to look forward to on cold, dark mornings, especially if behind each door is a chocolatey delight! I love advent calendars because every day holds a little surprise behind each door to indulge my taste buds.. I love advent calendars because the excitement knowing there’s a new surprise for 25 days. I love advent calenders because they make the countdown to Christmas even more exciting, and who doesn’t like chocolate in the morning? I love advent calendars as they give a little bit of excitement each day in the lead up to Christmas, especially one like this, lovely! I love advent calendars because I can legitimately eat chocolate before breakfast! I also love seeing what shape the chocolate is behind each door, and the anticipation as more windows get opened 🙂 Then of course I love the way they are seasonal so they get reduced and I get to buy cheap chocolate! I love advent calendars as they are a great way to look forward to Christmas and what better way to do that then with chocolate! I love Advent calendars because the first one up gets to open doors and eat all the chocolates, last one in bed loses. !! I love advent calendars because it’s lovely to have a little treat each day in the run up to Christmas. However if I won this I would probably give it to my daughter as she is working incredibly hard – and studying as well – at the moment. That’s what mother loves does for you! I love advent calendars because they brighten up the cold December mornings and add a little excitement to each day. advent calendars supply surprises something I get very little of, so to get 24 in one month is amazing. I love advents and so do my 7 kids…well I buy 7 for my 6 imaginary kids and 1 for my actual kid and a spare 1 for me…none of them happen to like chocolate…apart from me…surprise surprise! I love them because it brings out the child in me plus I don’t have to share with my brother anymore who used to eat all the chocolates! I love advent calendars because you wake up each morning to a chocolate for breakfast! I LOVE Advent Calendars, with a little chocolate treat every day to get me in training in the run up to Christmas when the REAL chocolate feasting begins! The little bit of excitement, when you remember each day! I love advent calendars because it gives you a little extra excitement each day, a sweet little gift for the festive month! I love Advent Calendars because I am still a kid at heart! It is an exciting reminder that Christmas is getting closer with the added bonus of a lovely piece of chocolate too. I love advent calendars because of the variety you gt to try. I love advent calendars because they add a magical touch of Christmas each and every day in December on the run up to the excitement of Christmas Day. It adds to the excitement of the build up to Christmas. As my daughter gets older the magic is starting to wear off for her a bit 🙁 But we still get excited about the advent calendar each morning! An advent calendar is not just for Christmas it’s for the whole of December. Advent calanders are a great way to build the anticipation of the holiday period for adults and children alike! I love Advent Calendars because they make the run up to Christmas even more exciting! I love advents calendars because.. it can take you back to your childhood.. the excitement and suspense of what’s behind the door the counting down many hours till you open the next one, I feel your never to old for an advent calendar let your inner child come out. I love advent calendars so much that the little people are getting two each this year! They remind me of the anticipation I had as a child of Santa coming and all those lovely pressies he left on my bed. I love advent calendars because I have been on a diet and am trying to continue so until the 25th December the 1 teeny tiny piece of choccy will be all the pleasure I will get each day….but on the 25th I will gorge myself on loads of chocolate and sweet treats and even some chocolate liqueur for maximum choccy overload. I love chocolate advent calendars because its such a treat to open that little window and receive a chocolate each time. As time goes on I know Christmas is drawing nearer, which adds to the excitement. I love advent calendars as they keep me reminded of how long I have left to organise all the food, the presents and all things Christmas! I love advent calendars because they enable me to have a chocolate per day, so that I’m not tempted to overindulge before Christmas. They’re great for keeping us motivated through December. We get up every morning with something to look forward to!! I love advent calendars because every morning I wake up I’m reminded somebody loves me and has left me a little treat, or if I bought it for myself at least I’m reminded I love me. I love to open my advent calendar at the end of the day. A little reward for finishing my daily tasks in the run up to Christmas. What can beat a surprise a day during the countdown to Christmas? In like advent calendars just to see my daughters face light up when she opens them each day towards her bigger presents from Santa. I love Advent calenders because it is a great way to builld up towards the big day, and you get to eat chocolate!! I love advent calendars because it’s a good excuse to have chocolate for breakfast! I love chocolate advent calendars because it’s the one time where it’s acceptable to have chocolate before you have breakfast! I love advent calendars as I can have a treat a day. A little of what you fancy does you good.